I thoroughly enjoy showing off the excellent resources our library has. I think I also have a secret passion for research in general. I am always encountering reasons to look up things. Whether it is the definition of a word, the life of a famous person, or obscure facts that strike my fancy I am always utilizing our library and the internet. Since today is Pie and Burger Day I started wondering where the Hamburger came from. It seems so very “All American” but is it really? Did the hamburger come from America or is it really a product of Hamburg, Germany as many rumors suggest? First I turned to the encyclopedia. I figured this would be a great jumping off point. I pulled out the World Book Encyclopedia Volume H. A quick scan of the H encyclopedia revealed……nothing. But, as a smart researcher I realized that does not mean the encyclopedia doesn’t contain information. I decided to pull out the Index, the last volume in the encyclopedia. It revealed that there is some information on Hamburgers under the food section in the article titled Interesting Facts About Food (F:329). Here is what I found. “Hamburger was orginally called Hamburg steak. It was named after Hamburg, Germany. A-HA!!!! Well that answers my question but I am not satisfied. I want to know more. Like is Hamburg Steak the same as a hamburger or did the hamburger evolve from Hamburg Steak? If so, what exactly is Hamburg Steak. How did a “german” food become so All American? The idea of eating ground meat is not new. There is evidence that the Ancient Egyptians ate ground meat patties. Throughout history there has been mention of various cultures eating similar foods. Hamburg Steak is a traditional German food that doesn’t really resemble today’s hamburger. It was brought to America in the 1850’s by German sailors and immigrants as a food that would last through long sea voyages. It was a form of salted and spiced meat that had to be chopped due to its tough consistency. Sometimes, it was served between two pieces of bread to immigrants arriving in American ports. Ground meat did not originally have the same consistency it does today. Before the invention of meat choppers and grinders ground meat was really just roughly chopped and chunky. Many people claim to have invented the hamburger as we know it today. Some say it was Charlie Nagreen of Seymour, Wisconsin who invented the first modern hamburger. The story goes that he was selling meatballs at the Outagamie County Fair when he realized they were too hard to eat while walking around the fair. To make them easier to eat he flattened them and put them between two pieces of bread. In a similar story the brothers Frank and Charles Menches from Akron, Ohio are said to have invented the first modern hamburger while traveling the county fair circuit. While in Hamburg, New York they invented the modern hamburger, naming it after the city. Others say Oscar Weber Bilby was the true inventor of the modern hamburger because he put the ground meat between buns, not bread. Well there you have it. The modern hamburger could be considered to be a product of Hamburg, Germany if only in the sense that Hamburg Steak is chopped of meat. While, that chopped up salty steak is definitely the inspiration for the ground meat, it does not taste the same. The modern hamburger came about as an easy way to eat less salty ground meat. Whether it is served between bread or bun it is a yummy delight that Americans and the world enjoy on a daily basis. Eat up all you Falcon’s, its Pie and Burger Day!!!! 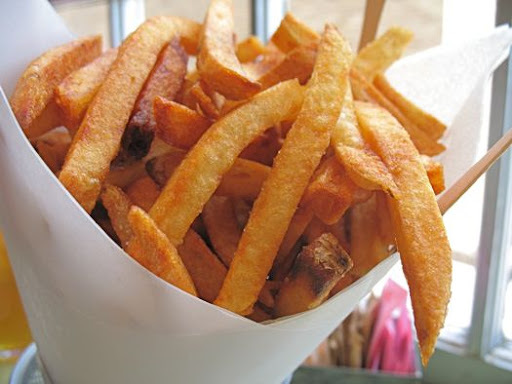 Anyone care to research the history of the French Fry?